In the not-so-distant past, Fiona Horne would turn right when she boarded a business aircraft. In her native Australia, she was a true rock star, lead singer of the popular ’90s band Def FX, then a television personality, actress and author. Yet today, in her current job as marketing manager and soon-to-be tour pilot for St. Croix-based charter provider and FBO Bohlke International Airways, she often finds herself at the controls of the aircraft. It is a strange evolution for the former celebrity who once helped christen Richard Branson’s Virgin Blue (now Virgin Australia). Horne is an inveterate thrill seeker who holds a world skydiving record, and a master scuba diver who practices fire dancing in her spare time, but for her the idea of becoming a pilot was late in coming. In 2001 she moved to Los Angeles, where she was offered a part in a television series. A friend there who was a CFI and owned a Decathlon would often take her aerobatic flying, which sparked the idea of earning her own pilot certificate. “I passed my checkride April 22, 2013, in a little Cessna 172 in Bakersfield, Calif., and it was at that time I decided I wanted to leave the entertainment industry and start a whole new career in aviation,” Horne said. While in St. Croix visiting a pilot friend she met during her training in Bakersfield, who had landed a job flying seaplanes for Caribbean airline Seaborne, she became smitten with the island and impulsively moved there. 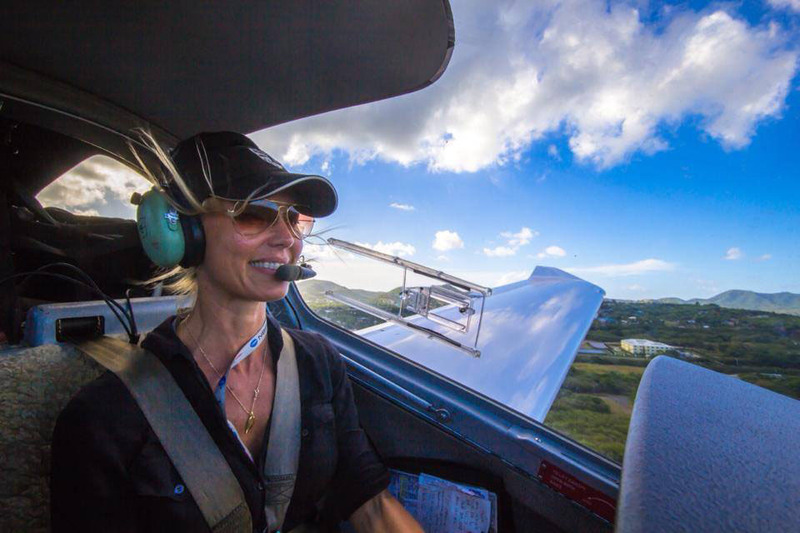 Fueling her passion for flying, she took to renting Bohlke’s Diamond DA-20 for jaunts around the islands and decided to approach the company for a job. On the strength of publicity skills earned during her career as well as her persistence, she was hired to fill the newly created position of marketing manager. Horne is also able to provide a different perspective for charter service. “I had significant experience as a [private] passenger, and I think that’s only made me more useful creating that service for other people,” she told AIN. “I can anticipate what their needs are, even when it comes down to keeping an eye on what catering is going on the airplane and how it’s presented.” She also spearheaded a partnership with luxury yacht destination provider Island Global Yachting that has proved beneficial to both companies.